The 1915 Fall Classic was notable mostly for the debut of a young twenty year old lefty named George Herman Ruth. "The Babe" and five others from Boston's pitching staff had won fourteen or more games for Manager Bill Carrigan on their way to a 101-50 record and were able to edge out the Detroit Tigers for the American League pennant. Another great pitcher, Grover Cleveland Alexander, a thirty-one game winner, and his Phillies had just won their first National League title and were ready to take their shot at the big one. Philadelphia was also stacked at the plate with Gavvy Cravath, who had led the league with twenty-four home runs and one-hundred fifteen runs batted in. Alexander was given the opening start against Ernie Shore and later emerged as both a 3-1 winner and the first World Series pitcher to shut down baseball's biggest legend. Ruth, who despite his eighteen victories was limited to this one appearance (as a pinch-hitter for Shore) grounded out in the ninth. Little was said at the time as no one could have possibly predicted what the future held for this promising pitcher from Baltimore. Boston turned the tables in Game 2 riding on the back of pitcher Rube Foster who held the Phillies to three hits and drove in the winning run in the ninth inning. Foster's one man show was witnessed by Woodrow Wilson, who was the first president ever to attend a Fall Classic. A true fan of the game, his appearance validated baseball as America's national pastime and many future chief executives would follow his lead. With the contest now tied at a game apiece, both teams traveled to Boston for Game 3. The cross-town Braves returned the favor from last year's championship by allowing the use of their yard in place of Fenway Park. Although the home of the Red Sox was considered a more attractive facility, Braves Field was much larger and could handle the capacity crowd of over 42,000. 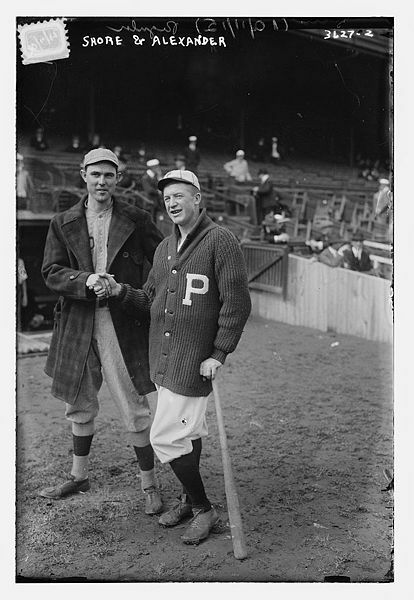 Philly ace, Grover Alexander returned for a second appearance against the left-handed Hubert "Dutch" Leonard. In spectacular fashion, the Red Sox pitcher retired the last twenty batters on the way to a 2-1 victory. Duffy Lewis drove home Harry Hooper in the ninth for the Series leading win. It was more of the same the following day when Philadelphia suffered it's three consecutive loss due to the outstanding performance on the mound by Game 1's loser Ernie Shore who only allowed seven hits in another 2-1 triumph. Boston had rolled over the City of Brotherly Love and wasn't showing any signs of slowing down. Despite the valiant efforts of first baseman Fred Luderus and reliever Eppa Rixey, Philadelphia was unable to hang on in Game 5. Offensively, Luderus had driven in a two run double and added a homer in the fourth giving his mates a 4-2 lead. Defensively, Rixey, who had taken over for Erskine Mayer in the third, shut out Boston through the seventh. However, the Phillies ran out of luck in the eighth inning after Duffy Lewis launched a game-tying, two run blast. Later in the ninth, Hooper added his second homerun for a 5-4 victory and the Red Sox' third World Championship. 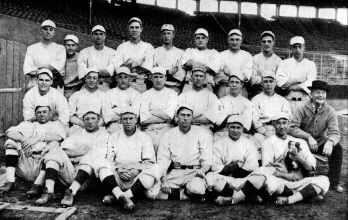 In a strange twist, the two other teams from Boston and Philadelphia, who were previous World Series contenders, experienced a very different story in 1915. Boston's Miracle Braves had run out of divine intervention and barely finished second in the National League and the Philadelphia Athletics, a Fall Classic mainstay, had completely disbanded and ended up in last place 58½ games behind the American League leading Red Sox. Babe Ruth's modest contribution went unnoticed although he would soon become the focal point of a World Series controversy that would haunt the Boston franchise for many years to come.